NOTE: This post is under construction. Please excuse our mess while we work to make this post more user-friendly. This list is a work in progress and was last updated on 4/20/2019. Ohio is one of the top wine-producing states in the country, has the largest Amish population in the world and is known as the roller coaster capital, thanks to the thrill seekers paradise, Cedar Point. Ohio is pretty diverse and most people have no idea of all that Ohio has to offer! Our goal for the past couple of years has been to explore that diversity and uncover some of the attractions and events that make Ohio not only a great place to live but also a great place to visit. The world’s largest market basket in Dresden is the size of a small house. As we discover new reasons to love our home state, we’ll write a post about it and share it here. Simply click on the link – or sentence that is blue or purplish- to go to that blog post to see what we have to say about that attraction or destination. Hopefully, our experiences will help you as you plan outings with your own children, spouse or travel buddies. We’ll also add a button to the sidebar so you can easily reference this post as we visit more Ohio attractions and add them to our list of things to do in Ohio. So make sure you bookmark this page, Pin it to your Ohio board, or share it so you’ll have it to refer back to when you’re looking for more ideas. For ease in navigation and reading, this post is broken up by region and then by larger cities within that region. For example, in northeast Ohio, you’ll find Cleveland, Medina, Mansfield, etc. This area borders Michigan, Indiana and Lake Erie. It stretches from Toledo to Sandusky, down to Bucyrus and into Mercer County. Popular attractions include Cedar Point Amusement Park, the Lake Erie islands, many historical sites and the Toledo Museum of Art. One of the Ohio state park lodges, Maumee Bay is a one-stop getaway. Book a stay in the hotel or one of the cabins on the property. Swim, boat or fish in Lake Erie, bird watch along the boardwalk or golf along the golf course that welcomed President Obama during his presidency. Maumee Bay is conveniently located only a short drive from Toledo. Grab a bite to eat and sign your buns at the original Tony Packo’s. Explore the Toledo Museum of Art and watch glass being blown across the street at the Glass Pavilion. Take a walk on the former world’s largest freighter at the National Museum of the Great Lakes. 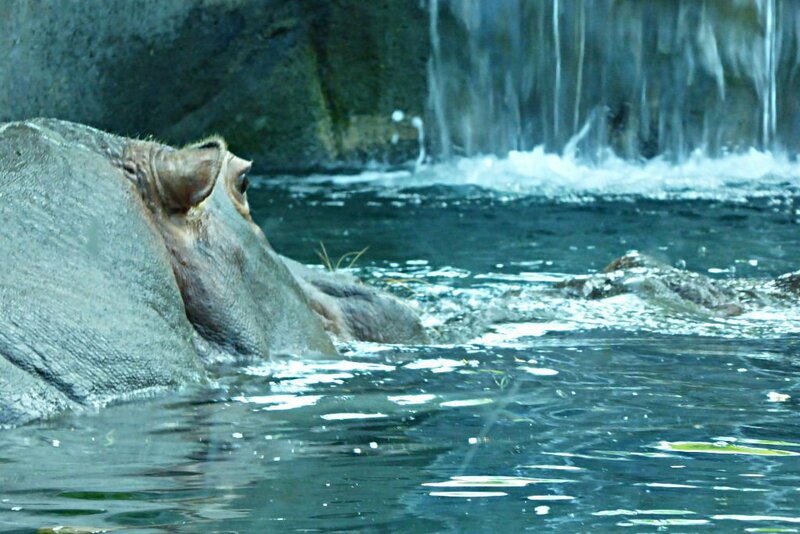 Watch the hippos swim in the world’s only Hippoquarium at the Toledo Zoo & Aquarium. Go bird watching at Magee Marsh. Learn about the history of the carousel, watch skilled wood carvers in action and take a ride on the in-house carousel. Learn about Lake Erie’s role in contributing to the growth of Sandusky and check out an impressive exhibit highlighting antique and vintage wooden boats at this regional museum. Tour seven distinct and impressive museums that include a glass museum, the Newton Arts Gallery, a general store that serves as a gift shop, and Four Seasons Statue Garden. This nature preserve is gorgeous any time of year and since most of it is paved, those pushing strollers or in wheelchairs or walkers can enjoy it too. This post includes some of our favorite museums and attractions that can easily be seen in one weekend in Sandusky. The Sawmill Creek Resort is located minutes from Cedar Point and offers seasonal activities like snowshoeing, enjoying the private beach, shopping, and dining in the on-site restaurant. Hotel Breakers has undergone an extensive renovation over the past couple of years which include enhanced outdoor areas and new furnishings and decor in the rooms. Hotel Kilbourne is the only boutique hotel in Sandusky. 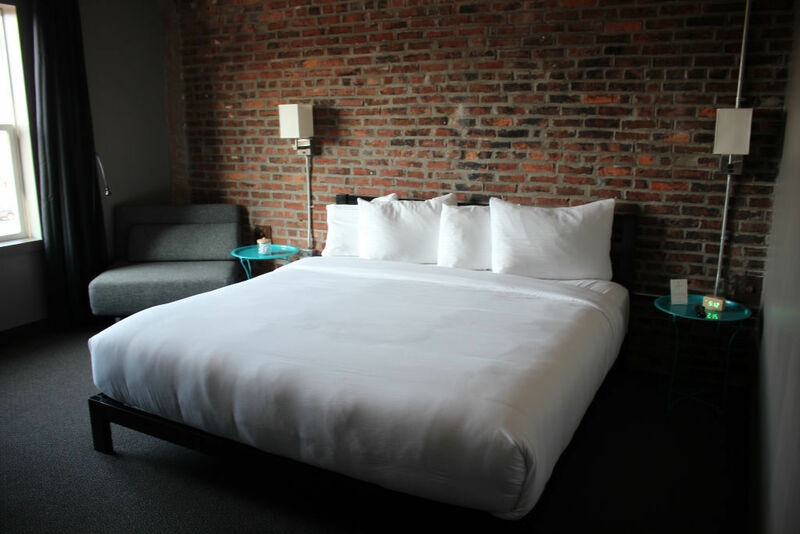 Conveniently located on Water Street, directly across from the Jet Express and Goodtime I terminals, the hotel features Moseley’s Public House, a rooftop bar and OH Taco! Guests of the hotel will not go hungry or thirsty and will find there’s plenty to do on foot so park your car and truly enjoy downtown Sandusky. Minutes from downtown Sandusky and located on the Cedar Point Causeway, the Holiday Inn Express offers large, comfortable rooms for families and even feature a kitchenette in some. Take a tour of Sandusky on foot or by joining Jim at Sandusky Segwave for a one or two hour tour and see Sandusky in a new light. 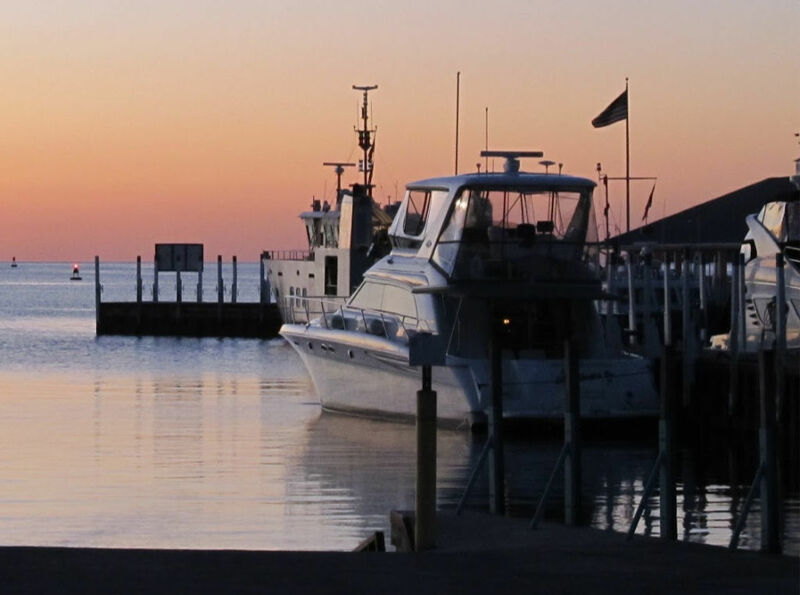 Enjoy a Sunset Bay Cruise on the Goodtime I which departs from downtown Sandusky during the summer months. Additional cruises are available including family cruises and teen and adult only sailings. Photograph the nearby lighthouses in Marblehead, Vermilion and Port Clinton. Enjoy a touch of nostalgia and seek out Handless Jacques: a Roadside Attraction in Marblehead. Conquer your fears and get your thrill on at Cedar Point and scream to your heart’s content during Halloweekends. Visit Ohio’s oldest dairy and enjoy an ice cream cone at Toft’s Dairy. Take an architectural walk of downtown Sandusky. Take a boat ride through the lagoons of Vermilion on the Mystic Belle. If you’ve never visited the islands in Lake Erie, you’re in for a pleasant surprise. South Bass, Middle Bass, and Kelleys Island are each a short ferry ride away from the mainland. You can travel to Put-in-Bay via Miller Boat Line or Jet Express in about 20 minutes. The Put-in-Bay tour train offers a great overview of the island’s highlights and provides easy hop on, hop off service to the top attractions. Learn about Oliver Hazard Perry, the War of 1812 and ride to the top of the world’s most massive doric column for a bird’s eye view of the surrounding islands. Rent kayaks for a chance to see the island through new eyes. Several possible routes are suggested which include kayaking around Gibraltar Island to kayak through the Needle’s Eye: One of Ohio’s Natural Arches or kayaking past the Ship House which is visible from the water. Descend into the cave under the Heineman Winery to step inside the world’s largest geode. Definitely a tourist trap, but one you should experience at least once. Grab your camera and stroll through the Scheef East Point Preserve and Massie Cliffside Preserve which offers a great view of the newly opened historic Lonz Winery. Eat your way along the island on the newly formed Put-in-Bay Foodie Trail. Some of our favorite spots include The Forge, the Boathouse Bar & Grill, Reel Bar, The Keys, and Cameo Pizza. Step into the Past at D. Picking & Co. The Kalahari is the largest waterpark hotel and waterpark in Ohio. From restaurants to a spa to a petting zoo and outdoor adventure park, you’ll find plenty to do year-round at the Kalahari. And while you’re there It’s Okay to be Pampered: Relax at Spa Kalahari. The 180-foot tall memorial in Lakeview Cemetery honors America’s 20th president, one of four killed in office. The Garfield Memorial is impressive on the outside, but the real beauty lies in the interior. Perhaps the biggest secret in Cleveland, this quiet garden provides an escape from the city. Adventure seekers converge on Go Ape where the zip line and adventure course. This course in Strongsville features 5 zip lines and 42 obstacles. This man-made eagle’s nest is modeled after a nest that was found in nearby Vermilion. A visit to Headlands Beach State Park (which is totally FREE) and you’ll have a hard time remembering that you’re standing on the shore of Lake Erie and not the ocean. Do you know where to Find the World’s Largest Drum Sticks in Ohio? Fans of David Grohl will want to add a pilgrimage to Warren Ohio to pay homage to the frontman of the Foo Fighters. Spending the night at Punderson Manor State Park Lodge isn’t for the faint of heart. This property is said to have made even skeptics believe in ghosts. If you love spending time in the outdoors and art, this trail is for you. Check out the images carved in rock in one of Ohio’s hidden gems. Book a room at the Glidden House and then spend the day exploring the museums of University Circle. Take a FREE Tour of the Old Stone Church in Downtown Cleveland. Get your American Ninja Warrior on at Play CLE. Spend the day at the Rock-n-Roll Hall of Fame. Go ice skating in Public Square. Take a Lolly the Trolley ride of Lakeview Cemetery. Journey to the End of the Commons, the oldest general store in the state. 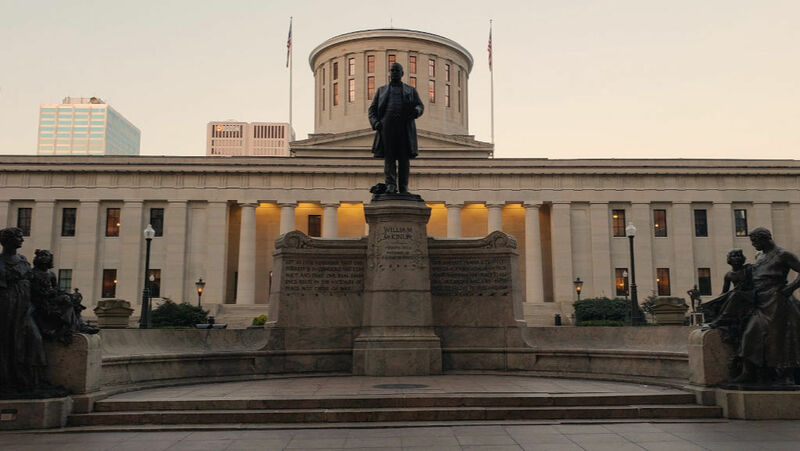 From touring the Ohio State House and public art displays to dining at an eclectic and lively restaurant, this post includes a list of some of our favorite things to do in Columbus with the kids but this can easily be adapted for fun date night ideas for couples. This giant roadside attraction is actually part of an extensive art trail that winds through Dublin, a suburb of Columbus. This park is modeled after the famous painting ‘A Sunday Afternoon on the Island of La Grand Jatte by George Seurat. It is the only park created from topiaries that is based entirely on a painting. This Lustron home was manufactured in Columbus and now resides in the Ohio History Connection to transport visitors to the 1950s. Columbus has a vibrant art community. From parks and gardens to public art displays to gorgeous architecture, there’s much to see and do in Ohio’s capital city. This Irish influenced community offers much to explore from an historic downtown, impressive art trail, world-class zoo as well as Irish cuisine, Celtic cocktails and a Fairy Door Trail. Thanks for the recommendations, Michelle. Spangler Candy Company has been on my list of places to explore for quite a while now. I just keep running out of time. While I did write the original post a few years ago, it is updated as I venture to more Ohio destinations as I hope it continues to be a valuable resource. Thanks so much for stopping by! Please don’t forget Mapleside Farms in Brunswick, Medina County. They host a large variety of special events over and above their apple farm heritage. Check out their website. Another place I have not visited yet but hear about is Castle Noel, a unique Christmas museum in Medina near the historic Medina Square (another nice place with events all year on the grounds). The Saturday farmers markets are wonderful at Medina Square along with the art shows, music shows, Christmas candlelight walk, ice carving festival, and many, many other fun events. Castle Noel is amazing I actually know the owner it is a really cool experience. Maybe I missed it but I didn’t see any mention of the wonder Native American historical sites in southern Ohio. Chillicothe, Dayton, Columbus of the Ancient Fort people and Adena cultures. I’ve made a few videos of my swing through that area this summer https://www.youtube.com/watch?v=0vwu_Cq3h9E. This one is on Fort Ancient. One of the largest effigy mounds in the WORLD is in Ohio, The Serpent Mound. Thanks for you list…I’ll be coming back through there because Ohio really has so much to see. You didn’t miss it. Up to this point, I’ve pretty much only added sites that I’ve been to personally to review and have had time to write about (that’s the kicker- getting those posts written). Have you been to Marietta? They have several mounds that you may want to check out as well. Thanks for sharing your video. I’ll check it out. The Serpant Mound is located east of Columbus in Newark, Ohio. Very cool history about our native Indians. I would visit them often as a child around the golf course as a child and heard the stories from my grandfather. Yes! And it’s on my list of places to explore! Thanks so much for the tip. The National Park Service Aviation Trail begins in Dayton with a museum complex displaying the story of the Wright Brothers and flight: Their print shop, a restored Wright Cycle Shop, and the site of their home. Downtown Dayton has a sculpture of them and their airplane, and another depicting the first 112-foot flight. A mile south at Carillon Park is a reconstructed bicycle shop and their 1905 Wright Flyer. Five miles east is a Wright Memorial overlooking the field where they learned to fly. The Visitor Center has a flight simulator so you can experience flying early planes. Then go to the spacious U.S. Air Force Museum for a free tour of the history of military flight, including hundreds of airplanes and a space capsule. Appropriately, you can bicycle the trail on bike-laned streets and on dedicated, paved bike trails. Or take a short driving tour. What about Renaissance Festivals! The Ohio Renaissance Festival in Harveysburg, Oh is so much fun. Great food, a variety of stage shows, crafts and medieval artisans. They are open Saturdays and Sundays from the first weekend in September to the middle of October. Make sure you try a “bread bowl”, take in a Jousting match, and see the Mudd Showe. Also the Great Lakes Medieval Faire is in Geneva, Oh (near Cleveland). They are also open Saturdays and Sundays from mid-July through mid-August. Huzzah! If you’re in Akron, you may want to go to Stan Hewitt Hall if you haven’t already. It’s a beautiful mansion, and it has spectacular gardens! 5 Oaks in Massillon is another, but you need to research ahead of time. The last I knew you had to schedule tours and have a party of at least 10 people. Canton has the McKinley Presidential Library & Museum (which is actually more fun than it sounds), the First Ladies Library, The Palace Theatre, etc. I hope it gives you some ideas. Happy traveling! We loved South Bass Island and learning about Perry’s Victory! What a great place to visit. I’m glad you enjoyed your visit to South Bass Island. It’s a trip I look forward to every year. This is great to know! Sounds like a great festival. I think I’d especially enjoy the Celtic dancers. Thanks for sharing! This is a great list for those of us who live here and would like to take day or weekend trips. Love your thorough list, Tonya! Thanks for putting this one together for folks that really want to know the best of Ohio! This is the coolest thing ever! With our kids finally at a good vacation age this will be the perfect guide for experiencing everything Ohio has to offer. I wonder if all states have this because another bucket list item is to visit all 50 states. We went there once, but 2 of us were sick. I would love to go back to The Wilds again. Have you been to Young’s Dairy? Near Springfield? I’ve driven past it and it looked like the happening place. But no, I’ve not been there. I would love to take my family on the Hocking Hills Scenic Railway sometime very soon. All my children love trains and taking trips on them. You would never think there would be so many things to do in Ohio! Thanks so much! We love CVSR. They have so many awesome trip and activities throughout the year! My boyfriend and I enjoy Rally on the River in Ironton, OH every year. They always have awesome bands playing. Great list! It really opened up my eyes to other attractions in Ohio! You have a great list here! There are so many things on there that I didn’t even know existed! I was surprised that I didn’t see Old Man’s Cave or Ash Cave on your list! If you want awesome food you should try Bella Bleu’s in Ashland. IT’S AMAZING! The food is wonderful. Also I HIGHLY recommend Lucky’s Cafe in Tremont (Cleveland). They have a fantastic Reuben. They brine their own corned beef and they MAKE THEIR OWN Sauerkraut. Yup, with cabbage from their garden next door. The desserts look great but I’m always stuffed unfortunately! If you come to Grandpa’s Cheesebarn in Ashland please let me know. I’ve never met a blogger before. I love Sweetie’s and their chocolates. Yum! kristiedonelson(at)gmail(dot)com Thank you. We LOVE the CVSR! We participate in Bike the Trail, Ride the Rail every year. Great activity for kids and adults alike! The historic landmarks would be on top my of to see list! Visiting baseball parks around Ohio is on my list, both Major and Minor League. As a runner I would like to participate in as many marathons in Ohio as I can. I’ve done the major ones – Toledo, Columbus, Cincinnati, Dayton and Cleveland…Some 2-3 times each! Your bucket list has me dying for adventure hehe. I haven’t been to cosi since I was a little girl. I haven’t explored Columbus much either other than concerts(and I go to a lot of those). My girlfriend and I are planning on a trip to hocking hills this summer, but I’ve always wanted to go to the tree houses at mohican too! Revisiting this list…there are still so many places to go in Ohio…and I’m sitting right in the middle of many of them!! Fantastic list. So many family friendly things to do. We can’t wait to visit the reformatory and biblewalk. When you visit Akron, Quaker Square’s hotel is AMAZING!!!! Made from the old grain silos, the rooms are round. Super-cool. Quaker square is now owned by the university of Akron and they use it for dorms! Hocking Hills and more, I never realized how much there was to do in Ohio and I live only 20 mins from it. if you are in the Columbus area, you should consider a trip to the Franklin Park Conservatory and Gardens. There is a historic conservatory building (where you can have a wedding or a party) and beautiful gardens surrounding it. Currently one of the biomes is filled with butterflies. There are community gardens and an outdoor cooking venue where,if you’re lucky, you may find wood fired pizzas being made. The park hosts many art, cooking and educational programs, as well as a farmers market (check their website for dates and times). Right now a 200 year old barn is being restored and built on the property! Come visit!!! I’ve planned on visiting the Franklin Park Conservatory for years! I really need to put it on my list of places to visit in Ohio this summer! Thank you for all the information. I’d love to visit! Born in Ohio, moved to California when I was 2, finally got back to visit my home state, hometown of Salem last October and November…..AND LOVED IT!! I’m so glad I found your site because I plan to get back to visit Salem and the whole state in the next year or so. This is going to be a treasure trove of things for my husband and me, along with my cousin, to do. Thank you so much!! We’ll be camping, so any hints about great campgrounds would be wonderful. I haven’t had time to look over your site very much. Maybe you already covered campgrounds, but if not, there’s another idea for you. Again, thank you and this is going to be a great adventure, thanks to this blog!! Welcome back to Ohio, Cynthy! I hope that my site will be a valuable resource for you, as I do write a lot about Ohio. I don’t have many camping stories. My husband and I camped regularly with our kids when they were younger and got away from that. He and I are planning to get back to camping this year so who knows? I may have some posts to share as the year goes on. Thanks for stopping by! If you have any questions, please don’t hesitate to reach out. Thank you! I’m always looking for a weekend road trip here in Ohio. We rented a cabin in Hocking Hills last year and visited Old Man Caves. Lots of beautiful scenery! Im not sure if you mentioned this or not. In Youngstown OH there is Mill Creek Park that is absolutely beautiful. There is hiking trails, paddle boats, a rose gardem and much more! Gorgious especially during the fall. Worth checking out. Thanks so much for the recommendations! I’ve not spent time in Youngstown and your suggestions sound perfect for me! If you are going to go antiquing, then you need to go to the antique capital of the mid-west, Waynesville! I wanted to let you know of a wonderful place to eat and take advantage of the lake. It’s called Geneva on the Lake. There is a historical diner up there called Eddies Grill. It’s open Memorial day through Labor day and is open air. It’s super popular with the locals and vacationers, so finding a seat can sometimes be difficult, but it’s definitely worth the wait! The town is super charming as well. Tons of small cottages to stay in on or near the lake, wineries for the adults, a strip of shops and restaurants and an arcade! There is also Madsen dougnuts, which are to die for!! Hope you add Geneva on the Lake to your bucket list! It’s well worth a visit! Thanks so much for leaving this comment, Sara. Geneva on the Lake sounds wonderful and I really hope that I’m able to visit this year. I’ll definitely check out Madsen for the doughnuts and Eddies Grill sounds right up my alley. I am not sure if I skipped over Geneva-On-The-Lake being mentioned, but if it wasn’t, make it be known now! Just outside of Ashatabula, sweet little strip filled with all kinds of exciting things to do. A must see is Firehouse Winery, which used to be a firehouse. A must stop while on the strip is Eddie’s Grill or Capo’s Pizza. Your can also see the worlds longest covered bridge in Ashtabula. Travel an hour or so south and go to Canfield to Whitehouse Fruit Farm to have their world famous blueberry doughnuts, that have been served by The Whitehouse…in Washington D.C. Yes indeed! Okay, “world famous” doughnuts definitely got my attention! Thanks for the ideas. I’m an Ohioan. Hocking Hills State Parks are a great visit, which I see you’ve done. You could always visit Glen Helen and John Bryan State Park in Yellowsprings, and even ride a bike on the bike trail from Yellowsprings, through Xenia, and onward. Xenia is known as the Bicycle Capital of the Mid-West. In Hocking County, they have Zip-line and Canopy Tours that are fun. You could also try Disc Golfing, there are tons of courses throughout Ohio in various towns that are beautiful and fun. There is also the National Afro-American Museum and Cultural Center in Wilberforce, Ohio, I loved it when I was in grade school. OU campus in Athens, Ohio has some great locations to check out, like the Ridges that’s on campus. If you are into haunted attractions around Halloween time, the Haunted Hoochie in Pataskla is a great haunted house to experience. Have you been to the Butler Institute of American Art? It is in Youngstown Ohio. It is free to everyone, open Tuesday thru Sunday from 11:00-4:00. It is a wonderful museum of American artists. Amazing collection!! I just came across this lovely post today. I have so much pride for Ohio and love when people take the time to explore what it has to offer. I know several have mentioned the Hocking Hills. I love not far from there and it truly is a gem. I didn’t read through everyone’s comments, so I apologize if someone already mentioned it, but the Circleville Pumpkin Show is something everyone should see once in their life! Circleville is my hometown and I do love me some Pumpkin Show!!!! 🙂 Chillicothe has Mound City, which is an ancient Hopewell burial ground. Very cool! Chillicothe also has Tecumseh, which is an outdoor drama about the legendary Shawnee leader. It is beautiful! Not sure if anyone mentioned it or not but you should check out http://www.shakerwoods.com/ and http://www.christmasinthewoodsohio.com/index.shtml Both in Columbiana, Ohio! Ohhh…I’m definitely interested in Christmas in the Woods. Thanks for sharing! When visiting Dayton, make sure you look into the metro parks. A few are kid centered or have kid friendly attractions. My favs are Wegryzn, Cox Arboretum and Aullwood. Near Wegrzyn is Boonshoft Children’s Museum, always a must for our visitors from out of town. My favorite festivals that I hadn’t seen mentioned earlier are Waynesville’s Sauerkraut Fest(second weekend in October), Centerville’s Americana (4th of July)- look for zombie dogs food truck, and during June-early July Springfield has weekly concerts in Cliff Park. I also enjoy the festivals at Fraze Pavilion in Kettering. I’ve heard of Wegryzn and always wanted to visit. Thanks for the tips! I’m so surprised nobody’s said anything about the COUNTY FAIRS! I grew up in Wellington, which is home to the Lorain County Fair, which is in late August. They have a huge array of animals for show, with auctions and competition. You can watch them milk cows each day, and they have draft horse pulls too. I love to go down each year (I live near Cleveland Hopkins Airport in North Olmsted now) and see the tractor pull and the combine derby—which is indeed a demolision derby with combines!!! I’ve heard it’s the best fair in the state, but my Youngstown friends always tout the Canfield Fair near Youngstown as the best. Also, Cleveland has an incredible culinary scene along with some great architecture. Downtown be sure to visit the Terminal Tower Observation Deck, which is on the 42nd floor of Cleveland’s iconic tower—it’s open on Saturday afternoons I think again, and I got to go to a special night tour this past winter. The Arcade is I believe the first indoor mall in the entire state, but in the 1880s (!) and has the most beautiful brass and glass interior architecture. Directly across from the Arcade is the East 4th Street entertainment district, which includes Iron Chef Michael Symon’s Lola, along with the one of the best comedy clubs in the country, Hilarities, at Pickwick & Frolic. It’s also well worth your while to check out the Rock & Roll Hall of Fame and the Great Lakes Science Center, as well as take a stroll out to Voinovich Park on the end of the East 9th Street Pier. As for neighborhoods, you can’t find more great breweries in one place than Ohio City, across the River from Downtown. They also have some of the best food, the West Side Market of course, a brand new Mitchell’s Ice Cream shop (which includes a factory where you can see them make the ice cream! ), and tons of cool Victorian houses along Bridge Avenue and Fulton Road. Tremont, just a small trip down Abbey Avenue from the West Side Market is home to one of the greatest Art Walks in the city, not to mention great restaurants, coffee shops, and Tremont Scoops Ice Cream. University Circle has tons of great museums, the Case Western Reserve University Campus, the Botanical Gardens, Rockefeller Park and the cultural gardens along MLK Drive, and the Western Reserve Historical Society. Just down from there is Little Italy, which feels like you’ve been transported to a whole other city and contains another huge concentration of art galleries, unique shops, and of course, Italian restaurants. Just up the hill from Little Italy is Coventry Village in Cleveland Heights, again with a full gamut of ethnic restaurants, cool stores, and the famous Big Fun novelty store. When in Cleveland Heights, also catch an independent film, documentary, or an old favorite at the Cedar Lee Theater, along with more restaurants and shops, as well as the Tudor Village at Cedar and Fairmount. The Shaker Lakes and Shaker Square are also beautiful places to see some beautiful homes and great architecture. Back on the West Side, I highly recommend visiting Lakewood, which has a booming restaurant and bar scene which includes the original Melt Bar & Grilled, featured plenty on the Food Channel, along with tons of art galleries all along Detroit and Madison Avenues. Be sure to drive down Clifton Boulevard as well as Lake Avenue and Edgewater Drive, where you find Cleveland’s best seafood restaurant overlooking Lake Erie and the city skyline at Pier W, as well as taking a walk along the promenade at Lakewood Park. Past Lakewood’s West End takes you across into Downtown Rocky River, and also has the northern terminus of the Cleveland Metroparks Valley Parkway, which has a parallel bike trail that runs for nearly 20 miles. Along the Valley Parkway, you will see one of Greater Cleveland’s best-kept secrets with the picturesque Rocky River’s 90-foot cliffs along either side of the river, as well as golf courses, hiking, waterfalls, and Rocky River Nature Center. The East Suburbs have their own, and arguably better counterpart along the Chagrin River between Downtown Willoughby (also worth the trip) and Chagrin Falls, an upscale village with a picturesque waterfall, Jeni’s ice cream, lots of little shops, and of course, the falls. A couple of other highlights of the Cleveland area would be the beaches, Edgewater Park has been cleaned up beautifully now, Huntington Beach in Bay Village, Lakeview Park in Lorain, and the ***best*** beach on Lake Erie—Headlands Beach near Mentor/Grand River/Painesville, which is the only NATURAL sand beach left on the American side of Lake Erie…it even includes a nature preserve protecting the dunes that used to be common along Ohio’s lakefront—it’ll make you swear you’re actually on the East Coast! By the way…if you hit Lakeview Park in Lorain, DEFINITELY check out K-Cream Korner just down the road at Oberlin and West Erie Avenues—they have the coolest vanilla ice cream/orange sherbet twist there! Awesome tips, Lee! I actually LOVE to spend time in Cleveland- I just haven’t found the time to write about our time there yet. My husband and I visited the Lake View Cemetery last year for a trolley tour and loved it. I had hoped to visit Melt at that time, but I’m still waiting. I see another trip is in order. Thanks for sharing. I’m definitely adding to my list. If you are in Sandusky again go to Tofts Dairy, they have the best ice cream. Also sandusky played a part I’m the Underground Railroad. I think there might be a tour. Just south of Sandusky is Milan, the birth place of Thomas Edison. you can tour the home he grew up in. Milan also hosts the Milan festival, where you can try homemade melon ice cream. Just west of Sandusky is castalia. home of the blue hole and the duck pond that never freezes. in Fremont Ohio you can your the President Hayes museum. Toft’s is yummy. I actually had it this past week in Bucyrus! Th Hayes Museum and home is gorgeous. My husband and I visited right after it had been renovated. When I was a child I used to visit a blue hole with my parents’ but I didn’t think it was open anymore. I’ll look into it and see if the one in Castalia is one in the same. Thanks for the suggestions! Correction on my part: the Longaberger giant basket HQ is actually in Licking. I meant to say I visited the Longaberger Homestead and Factory Stores in Muskingum. I love the giant basket! I’ve seen that and the giant Market Basket in Frazeysburg, but the Longaberger Homestead was closed the day I stopped so I didn’t see the giant apple basket. I definitely need to plan to stop back by. I grew up in Dayton and now live near Cincinnati. Dayton-University of Dayton see the “Ghetto” college housing, drink a beer at Flannigans or share a fishbowl at the Fieldhouse and dance at Timothy’s or in the Oregon District. Eat @ The Pine Club (bring cash only) it made a Top 10 International list of old restaurants steak and potatoes place. Some great places to add to my list! Thanks for sharing! You should put Yellow Springs on there. Lots of cute stores to shop and a great hiking trail. Also Cox Arboretum in Centerville. Thanks for the list. I’ve only lived in Ohio five years and thought I was running out of things to do. I’ve driven through Yellow Springs and it definitely looks like the type of place I’d enjoy spending time in. As a student from Ohio University I want to put in a plug for Athens! The university is set in the hills of the hocking hills area and is set in all brick even the roads! It’s a must see in the summer or fall when the leaves are changing. It truly is a special place-beautiful. Athens is home to lots of organic resturants and home breweries. Very unique! Also since you talked about wine in your blog when checking out Holmes county you should drive over to Breitenbaugh Winery they have cookouts some Saturdays. Lastly, tuscarawas county has a small park with amusement rides, batting cages, a pool, concessions, and lots more! I’ve worked there for many summers and I always love hearing where people have traveled from to come visit. Great bucket list you have! I’ve been told that the university campus is beautiful, but I’ve never stopped to see it. Definitely adding it to my list of places to see. Thanks so much! I almost forgot to mention the best burger place in Ohio… Thurman’s in German Village, Columbus, is home to some of the best burgers. The small, dark atmosphere serves up burgers on a paper plate and takes up the entire plate! They have recently opened up Son of Thurman’s on Sandusky St., in downtown Delaware, Ohio. I promise you that you won’t regret eating here. Thurman’s has been suggested more than once, so you know what that means? It must be great! I an’t wait to try it but it sounds like I may need to split the burger with someone else. A whole plate, really? Wow. Don’t forget to stop by Wright-Patterson Air Force Base in Dayton to visit the FREE musuem. It contains different types of planes and space/NASA equipment. Pretty cool! Also, in Dover, Ohio, there is Warther’s carvings and it has a very unique gift shop. I highly recommend! If you ever make it to the southeastern part of Ohio, in Monroe County, you should venture to Sardis. A small town along the river, it’s where I grew up. It’s such a small town, not even a stop light but everyone knows us for Ables Cheese. It’s a small store the locals frequent for snacks, fishing bait, even crafts, but most importantly, the best cheese around! In near by towns there are other sites to see. Fly, Ohio has an operational ferry that’s been there for years! Hannibal is home to the Hannibal Locks and Dam, which you can tour. In the country behind Hannibal is a place called Kiedaisch Point where you can look out over the entire Valley, it’s truly a breathtaking view. I’ve never heard of Sardis. It sounds like a great place to visit. I’d also like to visit the locks in Hannibal. Thanks for the recommendations! I didn’t see this one, in Marietta there’s a glass factory called Fenton glass factory. (Or maybe it’s on the WV side! I was little when we went there!) I thought it was a fun trip, they had free tours. Also good ice cream place: Handels! There’s a couple in the Akron/Kent area and one in Columbiana. I also remember going to Loveland, Ohio (near Dayton) to see a castle of some sort. Can’t wait to check back and see where you’ve gone! I’m headed through Marietta later this week, I’ll try to check out the glass factory. I have hoped to see the Loveland Castle for years…maybe I’ll finally make it this year. Thanks for the suggestions! If your ever in the onterio area out near mansfield (Richland county) there is a wonderful boutique I highly recommend visiting. The owner actually opened up a second in Ashland . It’s called B.E. Humble. The owner Brittany Humble is absolutely adorable and amazing at helping you find the perfect outfit. She has something for all ages and sizes and makes everyone look amazing. She’s expecting her second baby in June 2014 so she might not be around much then and her website isn’t getting updated as much but she has some wondeful employees that are super helpful too. You can find her on Facebook and Instagram or her website http://behumblefashion.com. She posts new arrivals on Facebook and Instagram and she ships. Around that area they also have some beautiful bike trails and the Blue patch which is fun for families. Also it’s near the ohio state reformatory you visited. Also loudenville is a fun place to go canoing, kayaking, rafting or relax in a tube floating down the river. My friends and I love to go canoing every summer. Also if you haven’t checked out the Columbus Zoo it’s a really great place to take the kids. They are getting a new African Safari exhibit the end of this spring. And they have a wonderful watermark Zoombezi Bay. Thank you for your wonderful blog post there are so many things I didn’t realize we’re in Ohio and can’t wait to check them out! If you come to Amish Country in Holmes Country, you must stop for breakfast or lunch at Rebecca’s Bistro https://www.facebook.com/rebeccasbistro, in Walnut Creek! A local favorite! Also stop in at Swiss Country Lawn & Crafts https://www.facebook.com/swisscountry, they have Outdoor Lawn Furniture and Swingsets(which is a great place for the kids to play) and inside they have lots of candles and home decor. Love this place! The bistro sounds perfect! Thanks! Y’all forgot the ultimate place…CEDAR POINT! Born and raised in Summit County, OH, so I’m here to vouch for the BEST in Akron. 🙂 I’m a world traveler as well so I won’t waste your time. If you’re in Akron: Our art museum is small, but it still has some neat pieces and is absolutely free on Thursdays. Just a block or two away is Lockview restaurant which is a restaurant and bar. Their best menu items include cheese – cheese lovers rejoice! My favorite macaroni and cheese worldwide was in Dana Point (Laguna Beach), CA at Salt Creek Grille until I had the mac and cheese at Lockview in my own back yard. NOT to be missed. If you feel like seeing a baseball game at our small, family-friendly Canal Park (AA), stop by the Peanut Shoppe but beware they close around 5 or 6 (last I checked) – such a fun, old school type of candy shop!! For an interesting factory tour, try Honeywell in Dayton. They manufacture turn out gear for firefighters. I didn’t even know we had a Honeywell Factory in Ohio. Thanks! I live in Ashland, but if you get up around Akron, find a place called Stricklands. Best Ice cream EVER!! Also Nelsonville, is home to the Rocky Boot factory, Hocking College, and is in the Hocking Hills. Great times on the last Friday of the month in the summer! My teens are always interested in ice cream. That may be enough to bribe them to go to Akron with me. 🙂 My grandma grew up in Nelsonville so I’ve heard a lot of stories from that area. Planning a trip back to Hocking Hills later this year. Thanks for the tips! One can not complete a bucket list with out going to the oldest running general store in the u.s???? With the largest horse and buggy??!! 😉 http://www.sillyamerica.com/blog/2011/03/worlds-largest-amish-horse-and-buggy-in-mesopotamia-ohio/ its a must! I highly recommend Holmes County for Amish. The Holmes-Wayne Amish settlement is the largest in the world. My husband makes his living driving Amish workers. Yes- it’s a real job! Just drive pretty much anywhere and you will pass Amish farm after Amish farm. Their business are plentiful and always interesting too! Berlin is more commercialized… I prefer Mt. Hope, Charm…. basically anywhere off the beaten path. I prefer off the beaten path as well. One of our favorite stops is to Miller’s Bakery- they have the best buttermilk cookies. My teens look forward to them every time we visit. There is so much that we haven’t seen in Amish Country. Would love to spend more time nosing around. I’m from Marietta, and if you’re looking for some great festivals to visit we’ve got Sternwheel in the fall and the Riverfront Roar in July. You should check it out! I actually drove past Marietta yesterday! I remember going to the Sternwheel Festival when I was little with my mom and dad and grandparents. I thought it was great then so I’m sure I’d enjoy it now. Thanks for the suggestion! There are a few places that you should add… cesser’s creek, sun watch Indian village, Carillon park (has a bunch of the Wright brother’s stuff) Wright Patterson air force museum. . I am from dayton ohio and these are some local specials also we have some great thrifty places too and jungle jims which is the most amazing grocery stores in the country! Jungle Jim’s is amazing. I was just disappointed because we visited when they weren’t offering tours or food samples. I’m definitely going to visit again so I can get the full experience. Thanks for the suggestions- I’ve not spent much time in Dayton. Just want to mention a sweet little town of Delaware halfway between Cincinnati and Cleveland. Great little shops, restaurants like Buns and Hamburger Inn, both over 100 years old and the Strand Theater, also over 100 years old.. We have a Whit’s Custard and Thurmans, home of the Thurmanator Burger. One of the best Arts’ Festivals in Ohio the weekend after Mothers’ Day, fabulous Farmers Market Wednesday afternoons and Saturday mornings. And, don’t forget the Little Brown Jug Horse Race at the Delaware County Fair the 3rd Thursday in Sept. with the All Horse Parade the Sunday before. And, I have to mention the overlooked Delaware State Park which is beautiful and has great camping and a wonderful beach and marina. Delaware is the birth place of Rutherford B. Hayes, the19th US President. Not to mention the Ohio Wesleyan University with the fabulous Gray Chapel where we are so fortunate to enjoy the Central Ohio Symphony. Great town you should not miss! Delaware is really close to me, but I haven’t been there for years. I’m especially interested in the restaurants and shopping. Sounds like a great place to explore. The Thurmanator sounds intriguing… Thanks for sharing! I’m from Auglaize County, Ohio! In Wapakoneta there’s the Neil Armstrong Museum which is really neat, and in this tiny little town called New Bremen there’s the Bicycle Museum of America which has lots of neat historic bicycles! Oh, and New Bremen also has a Giant Pumpkin festival each year… I think it’s called “Pumpkinfest”, but some years they try to break the world record for the largest pumpkin pie. I know they’ve broke it once or twice, just can’t remember if they still hold it. They usually do Giant Pumpkin carving and a series of other fun events with lots of food, and of course, lots of beer! I’ve actually visited the Neil Armstrong Museum, but that was pre-blog. 🙂 I’m not familiar with the Bicycle Museum but it sounds like a great stop! Thanks for sharing! My family loved visiting Ramseyer Farms when my kids were younger. Very fun. Don’t forget our Cleveland museums ! The Cleveland art museum is fantastic , and free. There is the Natural History museum, the Great Lakes Science Center, and the Rock and Roll museum too ! You could spend a great weekend in Cleveland visiting the museums ! We go all the time and my kids often take great classes at the museums too. I love the Cleveland Art Museum! I’m hoping to visit for the current Van Gogh exhibit- not free, but I’m sure it’s well worth the admission fee. Greene Co. is amazing! Cedarville has Cedar Cliff Falls which is a smaller version of Hocking Hills (and just as good IMO.) You can go off the trails and hike along the creek or follow the trail to see historic Indian Mounds. There are also gorgeous falls throughout the park, with a pretty good size one at the entrance that you can stand at the top of. Also, Yellow Springs is an adorable town with lots of murals on most buildings in downtown. Its also home to Young’s dairy where they make their own ice cream/cheese and have lots of activities for the kids! Also, In Madison Co. (my home!) be sure to check out Plain City. They have lots of Amish/Menonnites and great furniture/food shops. Also The Red Brick Tavern on the National Rd. in London has lodged 4(I think) Presidents and has pretty good food! I love Hocking Hills so I definitely need to check out Cedar Cliff Falls so I can compare. 🙂 I drove through Yellow Springs on the way to Clifton Mill to see the Christmas lights a couple years ago and it looked like a great place to explore. I don’t know if anyone mentioned it, but Ohio wine country is awesome. We booked a tour and went to 7 wineries in 2 days in Northeast Ohio. I think it was ohiovines.com, or ohiowines.com, you’ll have to google it. We stayed at an Irish B&B in Painesville which was lovely! I think it was Fitzgerald’s but i’m not sure. There are also some nice wineries near Sandusky and Vermillion. I’ve toured some of the wineries along the lake but that’s the extent of that. I’ll check out the website you suggested and the B & B in Painesville looks like it would be a great place for a getaway! While you are in Sandusky Ohio taking the ferry to Put-in-bay… ask about the Merry-Go-Round Museum. Head over to Dover to the Warther’s Museum (http://www.warthers.com). Go to the Troy Strawberry Festival. Or the Marion Popcorn Festival. How about the Civil War reenactment at George Rogers Clark Park in Springfield Ohio. Can’t miss the Wright Brother’s Museum in Dayton, or see the sculpture of the ‘actual flight’ in Downtown Dayton. Visit the Blue Danue restaurant in Columbus, or Hike Old Man’s Cave in Logan Ohio. Boy this Buckeye can go on and on… Serpent Mound?? Football Hall of Fame in Canton… ok, I’ll stop now. I wanted to visit the Merry-go-Round Museum last year but it was closed on the day I planned to go. Bummer. I’ll definitely make my way back up there so I’d love to pop in and explore. Don’t go to the Marion Popcorn Festival. I am from Caledonia and this annual festival is about as pathetic as it gets. There are WAY better fairs and festivals to enjoy fried food at that won’t involve gangs, drugs, or low budge entertainment. I went to the Marion Popcorn Festival when I was in high school and I remember it as fun then. You don’t really hear so much about it anymore (or I don’t). Thanks for the tip. Sounds like you have not been in SE Ohio too much. Down in Gallia County, you could go to the Bob Evans Farm Festival (usually the 14-16 of October)and see where Bob Evans started it all, visit the Mothman Bridge going in to West Virginia, take in a sporting event at the University of Rio Grande, head up to Jackson County and visit Fourmile Bakery to get a doughnut, while there stop over at the Fourmile Greenhouse(Amish and Mennonite establishments) Welsh culture is strong in both counties, while in Jackson see what is happening at the Markay Cultural Arts Center, they have performances and Art classes from local artists. If you are going through Chillicothe, the Majestic Theater also has a nice set of programs(Vern Riffe Center in Portsmouth has phenomenal performances as well).I did see other things people mentioned about Chillicothe, all great sights, the Lucy Hayes(Rutherford’ s wife)house is there as well. Tecumseh is a terrific performance if you have never been, happy travels!! Hey I came across this list from Pinterst! We currently live in New York but we are from Ohio and moving back soon! I thought it was so awesome that you are from the Mansfield area because we are from Shelby!! When I saw the list of things to do in your hometown I realized where you were from! Can’t wait to take my daughter to the Little Buckey Museum! Also I’m not sure if they still do it because its been years since I’ve been but the Ohio Historical Museum has this old town you can walk through and the have houses you can tour and demonstrations. Last time I was there they had and old fashion baseball game going on and all the players were in vintage uniforms. It was awesome and I plan on going again once we get back! The Ohio Village is only open on select days and events throughout the year so you’ll want to check that out when you get back. The Little Buckeye Children’s Museum is awesome! My kids always wish they were younger when we visit with my nephew. 🙂 You’ll also enjoy the carousel less than a block away. And Buckeye Bakery has the best donuts ever! If you need ideas when you move back, let me know. I live in Mansfield, I also work downtown on the square at one of the banks. The downtown area is becoming more and more popular again. the first Friday of every month they have things going on down there. The Carousel obviously and the little buckeye museum. We also have a tour on Mansfield where they open up the old building and take you through tours of them. We have open-mic nights at some of the places down there. Very exciting stuff happening there. But also in Columbus there is a whistle factory, where you can take a tour and see how they make them and then you receive one at the end of your tour. Very neat. Call ahead though and schedule a tour. There is so much to do in Ohio. The one thing I wish we did have though is the dinner shows such as Dixie Stampede or the Medieval Times Dinner. Good Luck with your bucket list and Thank you for reminding us of this wonderful place so many of us call home. 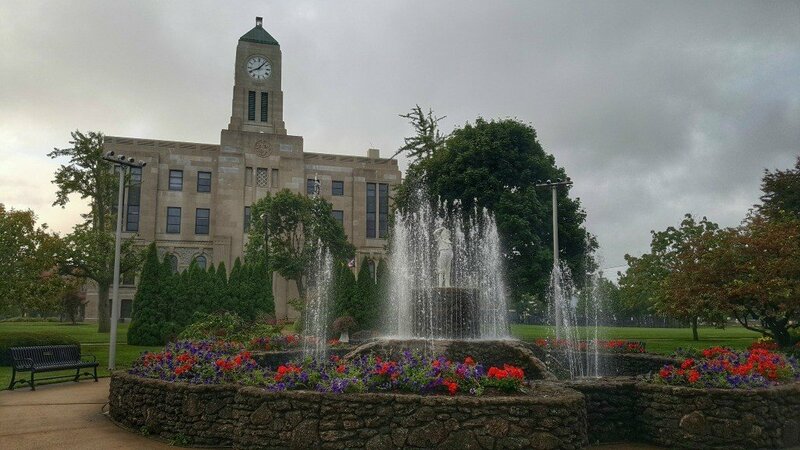 I’m from Conneaut, Ohio – sharpest corner of the state – and I may be a bit biased, but I love my little hometown. Conneaut Creek is a state wild and scenic river in Ohio and is famous for its steelhead fishing. But Conneaut’s true treasure is its gorgeous lake front, one of the nicest along the Lake Erie coastline, in my opinion. Township Park in Conneaut is site of the annual D-Day reenactment, which is a great family event. It really is a beautiful little town with some great hidden treasures. Well worth a visit! I’ve not spent any time in Conneaut. I think it’s time for that to change. Thanks for the suggestions. I’ve never even heard of the D-Day reenactment, but it sounds like it would be great. Tonya, I have two suggestions for you, if they haven’t already been mentioned. You should check out the boardwalk/ wetlands preserve at Maumee Bay State Park (they also have a very nice lodge to stay in there. And while you are in that general area, go and eat at Tony Packo’s in Toledo. Great food, and Jamie Farr made it famous when he talked about it on MASH. I’ve always wanted to visit Maumee State Park. Thanks for the tip on the lodge- I’ll look into it. Tony Packo’s sounds great! If you like anything and everything pumpkin, Circleville has the Pumpkin Show the 3rd week of October. You can get everything from pumpkin pie, pumpkin doughnuts, pumpkin waffles, pumpkin burgers, and pumpkin chili! They also have a contest for the biggest pumpkin, most weigh well over 1,000 pounds. I’ve been to the Pumpkin Show years and years ago when I was young. I’ve always wanted to take my kids. I’m hoping to go this year. My home town is #6 on this list. Marietta, Ohio in Washington County is awesome!! Historical first settlement in Ohio. Ohio River Museum, Campus Martius Museum, Underground Railroad history in the Cutler area outside Marietta, plus lots more. Marietta is definitely on my list of places to visit this summer. I’m especially interested in places that are off the beaten path so if you have more suggestions, please let me know. Marietta, Ohio (Washington County) has the Sternwheel Festival in September, Campus Martius Museum, Ohio River Museum, very quaint town with alot of history! I rode on one of the sternwheelers when I was little. It was so neat. Can’t wait to explore Marietta further. Saw a pin on Pinterest! I’m originally from Ohio. Family roots in Stark County. Might want to check out Canal Days in Canal Fulton, Ohio (Clay Park?) (I think in July of every year)! Lots of history in that area too. I hope they’ve preserved it. Locke 4 and all. Haven’t been back in years. Used to go with my grandmother to Hartville when I was very young. Loved it. If you are in the Akron/Canton area, I would definitely recommend eating at Gervasi Vineyards! It is a gorgeous winery in North Canton with great food and fabulous sangria! Especially fun to go in the summer and sit on the piazza and listen to live music! A must see for sure! And of course as a KSU grad, I have to say visiting the University and city of Kent is also a must! Kent State has a lot of history (May 4th Memorial) and the town is growing more and more everyday. You should check out Ray’s Place..a classic in Kent and a great place to eat. Thanks for the tips! I’d love to check out Kent so these are great suggestions. I’m from Scioto Co originally and transplanted to Virgina. This list makes me sad to have missed out on so much!! 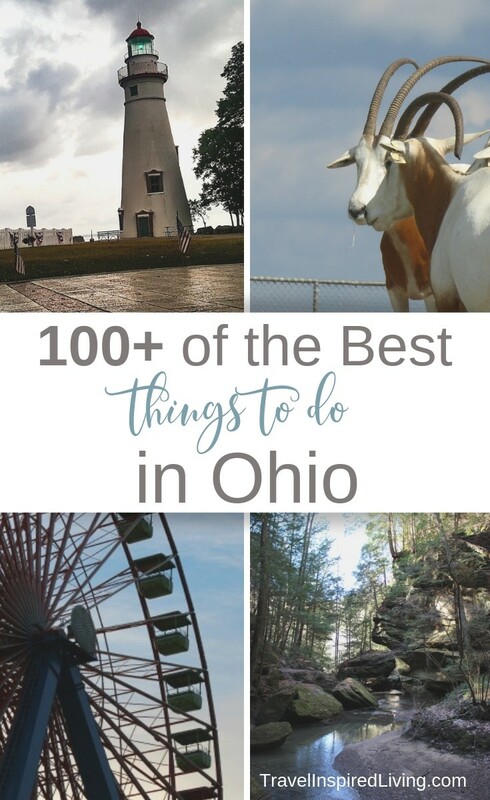 My area of the state gets a bad rap… But you should check out Serpent Mound, Hickie’s Hamburgers, the flood wall murals in Portsmouth, Shawnee State Park and Lake Vesuvius in Lawrence Co. My brother is moving back to Ohio with his 2 young kids so I will share this list with him!! A few years ago, my husband was working in Kentucky and so the kids and I followed him and stayed at a camper at Lake White. We were so close to Serpent Mound and didn’t make it! We did take time to visit the Portsmouth murals though. They were amazing! So I took a peak at the Art Cars website and I’m definitely intrigued. I want to go just to see the World’s Largest Collection of the World’s Smallest Collection of the World’s Largest Things. It sounds like it would go hand and hand with my obsession of roadside attractions. Thanks for the tip! My family has enjoyed several visits to Cincinnati. My husband and I were there a couple months ago. We wanted to visit some historic homes, but they were closed for the season. We did visit the aquarium though. And have enjoyed Krohn Conservatory in the past. Thanks for the tips! We have two drive-in theaters here in Mansfield too! They are so much fun in the summer! Everyone should go to the drive-in at least once. 🙂 Would love to visit Geneva. Are you thinking of the Renaissance Faire in Harversyburg? We’ve been there a couple times but not recently. Last time we went my entire family dressed up in costume. I’m sure my teens WOULD NOT do that now. 🙂 It was a blast though. Nelson Ledges sounds like fun and the Ohio Fallen Heroes Memorial is going on my list. Thanks for the tips! I’m not sure if any of this is in your list, or if you’ve heard of it. Mentor Ohio was home to James A Garfield, 20th president of the United States. His home is available for tours. My father had an apartment in Loudonville OH when I was a kid, it was nice to see them on the list. I haven’t been back in a few years, but that town always felt like stepping back a few decades when we would visit. They have a fun little town festival every fall that I loved. They also had fun attractions like waterslides, putt putt and go karts. It would be really neat to see all of the Nativity sets- I hope to see that in December. We spend time in the Loudonville area because we love Mohican State Park. I’m sure if you visited downtown today you’d think it still felt like stepping back into the past. Thanks for the tips! Kalahari is the best water park in Ohio! I definitely second Youngs jersey dairy too! Newport Aquarium is also pretty neat. There are so many things to do in Ohio, I’ve lived here all my life and yet there’s are about all I’ve visited. I’ve been to and live near all these places, if you would like further information let me know! I forgot to mention the strawberry festival in Troy! Best strawberry donuts ever! Tons of local craft and food vendors too. Airstream and Graeters are on my list. Just made it to Newport Aquarium a few weeks ago. Have always enjoyed the aquarium. Thanks for the tips! And the Strawberry Festival sounds fun too. I glossed over the previous comments and saw no mention of the Poultry Days festival in Versailles, Ohio. Best BBQ chicken in the state. I believe it happens in August. I may have missed it, but the Carillon Historical Park in Dayton is awesome, and also lets not for get the Air Force Museum. We haven’t been to the Air Force Museum for years! That was always a great spot to spend the day. I was glad to see Lehman’s on your list. Jay is my uncle. Amazing store! I didn’t read through all of the comment, so I don’t know if other Wayne County attractions were mentioned. Just 10 minutes north of Lehman’s is P Graham Dunn which I saw on your factory tour list. Probably 7 minutes from P Graham Dunn is the Smucker’s store, with all of the brands the JM Smucker company owns. Both of these places are closed on Sun also. In Holmes County, Hershberger’s truck patch on the way to Charm & Keim Lumber (another must see location) is fun. You can ride horses, go for a buggy ride, & feed the goats on the roof. The Farm at Walnut Creek is a cool experience. Take a wagon ride through & feed the animals, including giraffes. The first week-end in December they have a live nativity in the Journey to Bethlehem. Tuscora Park is an old style amusement park in New Philly open in the summer. Check it out with Warther’s Museum. The Hall of Fame hot air balloon launch in July is incredible. I loved Lehman’s! Your uncle has an amazing store! I can’t wait to go back and explore further. I’ve also been to P Graham Dunn and it’s pretty amazing too. Great suggestions. I’d love to see the live nativity. You can’t miss this park: Lake Metroparks Farmpark in Kirkland. It was a favorite place to go when my children were little and we visited Grandma. There are now two Jungle Jim’s. Make sure you visit the original. It’s on Route 4 in Fairfield. Yes! I’ve been to Jungle Jim’s, but unfortunately I wasn’t there when they offered tours or samples so I definitely need to return. You don’t have many places on your bucket list from the Cincinnati area. Do I see a bias? We have a Great Wolf Lodge here, too, right by Kings Island! Music Hall, Hamilton County Parks, Fossil Park, Ohio River, Underground Railroad sites, Rainman Tour, wonderful museums, zoo, camping, Conservatory, “haunted” tours, Finlay Market, besides the obvious sports teams. We have so many historical and archaeological sites one would be busy for a month. I was raised in Tuscarawas County, Ohio, and have been to many of the places on your list. Don’t forget Gnadenhutten, Schoenbrunn, Zoar, Zanesville, Athens, and many others. I’ve written about visits to Cincinnati on my site and my husband and I were there a couple months ago. I just haven’t had time to write about it yet. 🙂 So much too see, so little time. You really need to add the Hanoverton Inn to your bucket list. It’s also called the Spread Eagle Tavern and Inn. My husband and I enjoyed our stay with several other couple and the food was amazing. They had “ghost walks” available in the evening as well, although we didn’t do that. We stayed in the Lincoln Room, and Abraham Lincoln actually gave a speech in the room while on his campaign tour long ago. There really is nothing else to see or do in the town of Hanoverton, but we did stop at the P. Graham Dunn store on the way up, and it’s not far from Berlin either. Beautiful, beautiful place! I’ve never heard of Hanoverton Inn, but it sounds like something I’d like to check out. Only if I don’t see a ghost. 🙂 I love P Graham Dunn! Great restaurants in Cleveland- The Greenhouse Tavern, Red the Steakhouse, Happy Dog, and D’Agnese’s. Great Lakes Brewing Company has a great tour and great beer. Jeni’s Ice Cream is fantastic. Big Lyon’s Falls trail in Mohican State Park is an enjoyable hike. A picnic atop Mt. Jeez in Malabar Farm is something I do every year. The Nautica Queen Brunch Cruise in Cleveland is a must do. Go to a concert at the Grog Shop in Cleveland Hts. And check out PuppyPalooza at an Indians game! Great suggestions! I’ll keep these in mind when I visit the WestSide Market. Big Lyon’s is on my list to write about. Hasn’t been much of a falls the past few times we’ve hiked to it, but it’s still an enjoyable hike. One place I see that has been missed is Grandpa’s Cheesebarn in my home of Ashland, Ohio. Amazing place. Go to Sweety’s Chocolates in the same area. Heaven on Earth. You will love the whole place. Enjoy!! I’ve been to Grandpa’s Cheesebarn but missed the chocolate shop. I think I arrived too late in the day. Looks like I need to plan a trip back. I love this list, but cringed when I saw Castaway Bay on there. My family loves water parks, but we recently went to that one and were quite disappointed. It was really small, and the kids wanted to leave after a couple hours because they were so cold. The website says they keep it 82 degrees, but my son seriously looked like a vampire he was so white. Great Wolf Lodge is ok, and Fort Rapids in Columbus is ok, but once you go to Kalahari everything else seems lame. Kalahari all the way! I wouldn’t take my teens to Castaway Bay or Great Wolf Lodge, but my younger nieces and nephews loved the smaller water parks. My teens loved Kalahari. Their only complaint is how long the lines can be to go down some of the slides. Stan Hywet Hall in Akron is a pretty place to spend the afternoon. We usually take a picnic and eat by the Carriage House and then tour the gardens and conservatory. The manor is fascinating, but probably not the best bet for younger kids. It’s exceptionally pretty at Christmas time, of course, but then you have the crowds to deal with. In summers past, they have had a native butterfly display as well. My husband and I took a behind the scenes tour at Stan Hywet last year. It was so much fun and we explored all the nooks and crannies. Great ideas! Between your post and the comments I now have a whole list of cool places to visit in my new home state! I might add the WORKS museum in Newark (right down the road from the Longaberger Basket Co). It’s a great hands on science Museum that also has glass blowing demos and great programs for the kids. Also mastadon fossils and historical relics from Ohio’s rich past. Around the corner from Newark is the quaint village of Granville. It bosts a historical museum, great shops and (what I believe is) the original Whits custard shop. With all the comments, I’ve got an entirely new bucket list! Thanks for the suggestions. I’m going to check out Whit’s. If you’re in Newark don’t forget a stroll through the Indian Mound Earthworks! I’ve always wanted to go but never have. Yes, the comments have kind of taken on a life of their own! I love the comments because every time I get a new one, I learn about another place to go. 🙂 The Appleseed Drama is no longer in operation. Wildlights is fun- my kids always loved it when they were little. Mt. Gilead State Park is nearby, but I’ve never been there. Adding it to my list. Thanks for the tips! If you’re ever in the Canton/Akron area, be sure to check out Harry London’s, where you take a tour of a chocolate factory! I’ve not been to Young’s but it looks like it’s a pretty popular place to visit. Stop by Tiffin and visit the Ballreich’s Potato Chip Factory YUMMY!!! We also have the Tiffin glass museum with a stunning array of very sought after glass items. One more great place that I could suggest is Seneca Caverns in Bellevue (15248 E Township Road 178, Bellevue, OH 44811) They have the oldest recorded cave in the state. It is a beautiful work of nature and a wonderful adventure for the whole family. Yum…I love Ballreich’s Potato Chips. A factory tour would be great. Don’t forget Roscoe Village and The Wilds. Lots of fun. We combined with a stay at Salt Fork Lodge. I have been doing a fishing tour of Ohio, lived here most of my life and am finding more parks, bridges, creeks and streams than I ever knew existed! Awesome! I have been so many places, and many more to go! never know when I am going to find a piece of history right where I am at either. Sounds like a great way to see the state! Also, if you are looking for great pizza near Toledo there is a family friendly bar called the Country Keg in Graytown. It is by far the best pizza I have ever had! That’s great to know. Pizza is always a popular dinner choice with teenagers! Thanks, Matt. My teens would love ziplining and I’ve heard good things about Tree Frog Canopy Tours. Hi there! I’m originally from Toronto, OH, but I live in Youngstown now with my fiance. East Liverpool has a 4 story antique mall that overlooks the Ohio River — definitely one of the best that I’ve been to. (If you go there, you *must* check out the Hot Dog Shoppe for lunch, and if you have time the Homer Laughlin factory is just across the river if you’re interested in a WV jaunt. That is where they make all of the Fiestaware plates, and you can score aaamaaazing deals in their seconds room.) Youngstown is home to the 2nd largest metropark in the country (even bigger than NYC’s Central Park! ), and it has a huge variety of trails and attractions scattered through it. You can also find the Butler Institute of American art right on Youngstown State University’s campus. It was the first museum in the US dedicated to strictly American art, and contains paintings by Mary Cassatt, Norman Rockwell, Jasper Johns, Edward Hopper, and many more big names in art. It’s great to learn more about Youngstown. I was scheduled to fly out of the regional airport a couple months ago and struck up a conversation with one of the passengers who had grown up in the area. They really couldn’t point me to anything in Youngstown but I’ve read that the area has undergone a revitalization. I hope the trails on the metropark are marked better than Central Park! 🙂 The tips sound great- several things I’m interested in. Especially the antique store. Sounds like the perfect way to spend an afternoon. How have you not been to Michigan? GO!!! The west has giant sand dunes and lighthouses on Lake Michigan, and if you go up to Mackinaw, you can step in Lake Michigan on one side of the bridge and Lake Huron on the other! Mackinaw Island has a bunch of family things to do (famous Grand Hotel, butterfly gardens, Fort Mackinaw with reenactors, etc. ), with a fort and museum on the mainland, too. On the other side of the bridge, just in the UP, there’s a Native American Ojibway museum, a deer park, and train/steamboat activities. There are a whole bunch of waterfalls, campgrounds, and lighthouses. Drive an hour or two north, and you can visit The Shipwreck Museum on Lake Superior. Go west a ways (an hour or two) and you get to the Painted Rocks National Lakeshore. There is soooooo much to do in Michigan! And if you make it up to the UP, eat a pasty for me! (I’m from Ohio). I guess I’ve been too busy driving to California! 🙂 Seriously, I don’t know how on earth we’ve missed Michigan. I think it’s because it’s so close, I just thought I could visit anytime. Everything you’ve mentioned sounds wonderful and I’ve actually taken a look at the Grand Hotel- I love that porch! I’m hoping to make it this year.Keeping my fingers crossed. 🙂 Great suggestions! beautiful homes. There is a cemetery there with gravesites of soldiers who died in the Civil war! Just a neat place!!! Thanks, Linda! I’ve heard of the cemetery. Will definitely check it out next time I’m in Marblehead. I believe Johnson’s Island is right down from the Keeper’s House, another attraction that I’d like to visit. If you ever get to Bettsville, to that Haslingers orchard, just east of there is Fremont. ohio that has the Rutherford B. Hayes house and museum. The house is beautiful and the grounds are amazing to walk around. Just east o there is my hometown of Bellevue. I read that you went to the Seneca caverns, but did you know that Bellevue also has a train museum and a place called Historic Lyme Village? In September I believe, they have an outside thing going on that includes people in civil war camps set up and also Abraham Lincoln. They have cloggers performing and also Indian campsites. Fun for all as they have an oldtime schoolhouse that children can go to and they show old games that the kids can play. Also different Indian instruments that they teach the kids to play. I try to make it every year. My husband and I toured Spiegel Grove last spring and loved it. What an amazing property! Thanks for the suggestions in Bellevue- I’ve driven past Historic Lyme Village but didn’t really know much about it. It sounds like September would be thee perfect time to check it out. I just wanted to add one that I did not see as I scrolled through the various comments–The Plastic Brick Museum in Bellaire Ohio. Better known as “the unofficial Lego Musuem”. There are some old fashioned toys from your childhood that you can show your children, but the focus of the museum is on Lego structures. It was well worth our trip across the state. The admission is $8/adults and $6/children. We spent more than 2 hrs. there, but I would have stayed longer and checked out more of the details of the models if we did not have a long drive back home. It is in an old elementary school building with both 3-D Lego models and flat (a black and white “painting” of Mt. Rushmore) designs everywhere. A life sized 3-D spiderman, 7′ tall 3-D giraffe, miniature model of the white house, 3-D Statue of Liberty, and so many more. I’ve never even heard of the Plastic Brick Museum– I would have visited sooner! Thanks for the tip. It sounds great! When you plan your weekend in Toledo, some places to consider visiting is the Toledo Art Museum, the Toledo Zoo (I believe it’s ranked in the top 10 of the country), Imagination Station (a wonderfully awesome science place that’s great for people of all ages), the Botanical Gardens, and Sauder Village is not too far. A unique, and delicious, place to eat would be the original Tony Packo’s on Consaul. Jamie Farr’s character, Klinger, on the t.v. show MASH often talked of it. Famous people from Toledo and all over the world have come to it and autographed a hotdog bun there. There has to be quite a bit more; but I believe those are the highlights. I haven’t been to Toledo since I was little and visited the zoo with my grandparents. I think it’s definitely time for a return visit. Love the tie in to MASH, what a fascinating tidbit. Adding it to my list! Also, if visiting in the summer, check out a Mud Hens baseball game. Great time for not a lot of money. A Mud Hens game would be a lot of fun! Why do I always overlook them? Great tip! We plan to explore Ohio Caverns this summer. Great list! Some of my favorite Ohio places include End of the Commons General Store in Mesopotamia which has an old fashioned charm and Amish country treats. The Kent State Fashion Museum is another great place to see as well as the city of Kent. Short North gallery hops in the summer is a fun Columbus activity. Looking forward to summer to go new places! I’ve never even heard of Mesopotamia. The roadside attraction junkie in me wants to visit just to get a picture of the sign! 😉 My daughter would probably love the fashion museum. Great tips! Piatt Castles is in Logan County. There is Zane Caverns, Madriver Mtn-great place during winter months even if you don’t ski! Highest Point in Ohio, Campbell Hill. There’s a Hot Air Balloon Festival in Marysville. Honda Homecoming Parade with hundreds of lighted and decorated motorcycles in Bellefontaine. Pumpkin Festival in Circleville. Don’t forget Cedar Point (Roller Coaster Capital of the world) and Kings Island (largest amusement and water park of the Midwest) ! Just a few high points (Campbell Hill) and low points (caverns) of the state!! Julie, when in Marion don’t forget the Marion Popcorn Festival! Held the first weekend after Labor Day, from Thursday through Saturday,and takes place in the streets of downtown Marion!. They have big name entertainment play free to the public with one night being a country act and the other a pop/rock act, as well as a cover band for the opening night on Thursday It’s a rather large festival with lots of food concessions, kids rides, entertainment, beer gardens, parades, and more! Worth the trip to catch a free concert? You can visit http://www.popcornfestival.com for more details. I’ve been to the Popcorn Festival several times, but I really want to visit the Popcorn Museum. 🙂 Planning a trip now. Apple orchard is Haslingers. And not Burnsville correction, Bettsville. Darn auto correct. Thanks for the update,Regina. I’m beginning to think I need an auto correct for my auto correct! 🙂 I love your recommendations. Definitely planning a stop at Wilson’s! When in northwest ohio, if on rt 6 about 25 minutes west of 75 is an apple orchard called Headliners with thw best apple cider. Not terribly far from their maybe 20 minutes SW is a farmers market on rt 12 near a town called Burnsville. They have some of the best produce, plants and flowers. If while traveling on 75 you stop in Findlay you have to go Wilson’s hamburgers. They’ve been around for ages. Other great stops in Findlay would be Oler’s for the margaritas and Dietsch’s for the ice cream and chocolate covered pretzels. While in town you can visit Riverside park and go for a canoe or paddle boat if you wish too. Don’t forget Mohican State Park. It’s gorgeous. I love Mohican! Our first camping trip was at the state park when they still rented tee pee’s. It was so much fun for our kids. We love to hike there. You’re right, it is gorgeous. We live near Cincinnati and have done the Cincinnati Underground tour. It gives the history of how Cinci was settled and a tour of Over-the-Rhine. It’s one of the most interesting things we’ve done here. I would love to do the Underground Tour. I read about it from another blogger and it looked very interesting! Thanks for the tips, I’ll check them out. Oh, and don’t forget the west side market in Cleveland! I’m heading to the Westside Market next week! I can’t wait. I’ve wanted to go for years so I’m really excited. Pro football hall of fame in Canton, The Hot Dog Shoppe in Warren is fantastic, Cleveland Zoo, Schmidt’s Sausage Haus in the German village of Columbus is an experience, COSI if you have kids. There’s tons to do in Ohio! I love the Cleveland Zoo and the Rainforest! We had a membership when my kids were younger. The German Village is awesome, but I’ve not eaten at Schmidt’s. Must do that on my next trip. COSI has always been a favorite for my family. Thanks for the suggestions! Champaign County has the Piatt Castles, Ohio Caverns, and over a dozen cute shops in downtwon Urbana, mainly vintage and antique. There’s a Home & Garden Tour the last weekend in June. Also, there’s a Flea Market the first weekend of each month (except August) in Urbana. All this just 50 minutes west of Columbus. My husband and I celebrated one of our wedding anniversaries touring the castles and really enjoyed it. I wish we would have stuck around to explore Urbana. It looked charming. I’d love to visit again. Cleveland’s West Side Market is a destination not to be missed? The vast variety of ethnic vendors is a cultural delight sure to please all of your senses! Heading there next week. I can’t wait! I’ve never heard of the Horse and Carraige Parade and Christmas Festival. It sounds like something I’d love to see. Are carraige rides available? Great tips! I’m definitely going to look into these further and I’m thinking a trip to Ohio’s oldest inn would be pretty amazing. I don’t think carriage rides are available, which seems strange, but I’ve never seen them offered. The carriages in the parade aren’t necessarily the kind you see downtown in big cities. Some are traditional carriages, but there are also antique vehicles like fire wagons or milk wagons, and various other carriages. Also, there are so many things to do in the greater Cincinnati area, but one that is not to be missed is the Underground Railroad Freedom Center right on the river. Carraige rides or not, it still sounds like a fascinating festival. My husband and I just returned from a trip to Cincinnati. Sadly, we only had time for the aquarium. I live in central Ohio and there are so many things to do here! The Columbus Zoo is always great, the Columbus Art Museum, COSI is a must, and for awesome food the North Market is awesome, and in the short north which has a wonderful variety of shops and eateries. To the south in Fairfield County is Rockmill, an original restored grist mill with the largest waterwheel in the US, it sits at the top of a gorge and looks over the upper falls of the Hocking River. There are plenty of covered bridges to see in the area if that’s your think, and the childhood home of General Sherman is open for tours. In nearby Ross County is Chillicothe, the first state capital, with the preserved plantation home of Thomas Worthington, Ohio’s statehood founder and the founder of ohio university. They give wonderful historic tours of the homestead and have a beautiful new museum that covers subjects from Worthing to pioneer life to local Native American history. check out the adena and hopewell Indian mounds at the park across the highway from the plantation, there is also a museum there. You can also find the outdoor ampitheatre production of Tecumseh, the great Shawnee warrior, who was born nearby. There are so much more things to see and do in this part of Ohio…Hocking Hills are awesome, I recommend Cantwell Cliffs or Conkles Hollow as nice hikes and an alternative to the always busy Old Mans Cave. Plenty of accommodations for overnight stays, and there are now zip lines in the area for the adventurous! There is also a trainride that starts in Nelsonville and ends in Athens that is fun. I’m a huge fan of the Columbus Zoo and when my kids were younger, my husband and I made sure we always had a membership to COSI. I admit that I’ve never been to the North Market, though I’ve heard so much about it. Rockmill is definitely on my radar now as are the covered bridges- thanks so much for the recommendations! My husband and I visited Adena last year and really enjoyed our tour. Unfortunately, it was raining and we were short on time (just passing through) so we weren’t able to explore the grounds as much as I would have liked. I LOVE Hocking Hills! My family has enjoyed seeing Old Mans Cave, Conkles Hollow and Rock House. Each year we want to return but somehow haven’t managed. I’d love to return and spend the night at Glen Laurel or Ravenwood Castle. Great tips! Thanks so much for the recommendations- these are exactly the type of attractions my family enjoys visiting. The Olentangy Caverns (north of Columbus on Rt. 23) is a nice way to cool off in the summer and see how early settlers and native American tribes lived in them. Fans of architect Frank Lloyd Wright can tour one of his restored homes, Westcott House, in Springfield (near Dayton). It’s beautiful! I’ve never been to the Olentangy Caverns. Sounds like it would be cool– no pun intended. 🙂 I’d love to see Westcott- there’s definitely room for that on my list. Thank you for the list! There are some great places in here that I’ve never heard of before (like Landoll’s) that I’d like to now see. 🙂 If you are interested in a few tips from a NE Ohioan: If you go to the Hartville Flea Market, stop at Hartville Kitchen for lunch. The Cuyahoga Valley Railroad sometimes has specials on Groupon and their website. We went in September and tickets were buy one get one free. They even have a complementary shuttle that will transport you to and from the Akron Zoo (and maybe some other places–I don’t remember which ones, though). When we would travel the state, we used some of Neil Zurcher’s One Tank Trips books. A lot of these places are similar to Roadside America attractions. Have fun! Sorry–just saw your post about Hartville Kitchen. Glad you enjoyed it! I still think that Hartville Kitchen had the best fresh peach pie ever. It was so yummy, it makes my mouth water just thinking about it. I’m not sure if you looked around my site at all, if you did I’m sure you can tell that I’m a fan of roadside attractions! The One Tank Books are awesome. I used to check them out of the library repeatedly. I’ve tried to convince my husband that we need to take a repeat trip to Landoll’s, but in the winter so I can have a sleigh ride. I originally looked at this list thinking it would be good inspiration for some short day trips with the kids this summer. I never realized how many things I drive past almost every day and never really think about! I guess we take for granted what’s always in front of us. The Little Buckeye Museum is great for the little ones (and the grownups!) And while you’re downtown, check out the Richland Carousel and grab lunch at Coney Island. We can spend a whole day there and it’s just minutes from home! I also highly recommend the Rock and Roll Hall of Fame for any music lovers, and the tour of the Christmas Story house is pretty fun, too!! Jill, This is exactly why I started this list. I do take the attractions around me for granted. There is so much to do in Ohio that I just overlook. I hope this bucket list gives you some ideas of places to go! I’ve enjoyed reading the comments with suggestions for me as well. Hocking Hills State Park is fantastic. We spent many weekends there when our kids were young. You might try the winter hike next January. I think it is the 3rd Sat. in Jan. You will walk from Upper Falls at Old Man’s Cave, to Cedar Falls where there will be hot bean soup, cornbread, and hot chocolate for a donation, then journey to Ash Cave where buses will pick you up and take you back to your car. Think it is about a3-5 mile hike, but one you will never forget. We have done it several times. I love Hocking Hills. I really detest cold, but the hike does sound unforgettable. I had hoped to visit the area this winter so I could take some pictures. I’d love to photograph a frozen waterfall. This is a great suggestion! We just went to Old Mans Cave, Cedar Falls, and Ash Cave and had a blast. The ice was still everywhere but the weather was 49 degrees. We plan to go back this summer to hike more of it. I’m okay with ice when the temperatures are near 50. I’m hoping to visit Hocking Hills again this summer as well. The first time I was there, I could not get over how beautiful it was. Have you hiked to Rock House? It was great and my kids (who were much smaller at the time) loved it. Check out Bowling green and go to the historical museum right off of I-75 to see the fingers. I loved seeing them when I was a kid and still do when I make it back home. Then there is a small town named Tontogany just west of BG at a bar called Doc’s and have the best ribs in Wood county. And just west of that in October I believe is the apple butter festival in Grand Rapids. In Grand Rapids too in the summer months you can take a canal ride on the Erie Canal along side the Maumee river. Great suggestions! I’ve not spent anytime in Bowling Green and didn’t even know Ohio had a Grand Rapids. The canal ride would be a great addition to my bucket list. Thanks for the ideas! 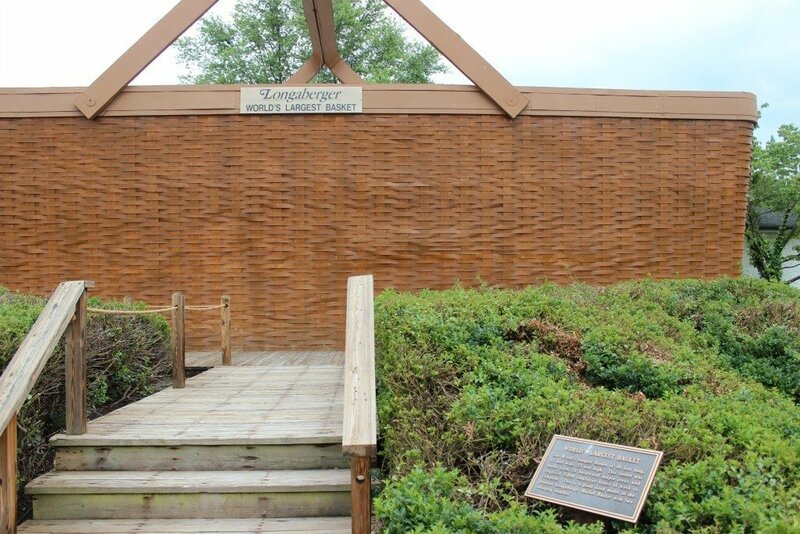 Why not stay in the “honeycombs” at Honey Run, Amish country? That’d be a unique place to stay, crossed off the bucket list. I’m so glad you mentioned the Honeycombs. I’ve never heard of them and it sounds like it would be a fabulous getaway! Nice list! We’ve spent fun days in Toledo and Columbus while driving through Ohio the past two summers. Definitely need to take the child to the USAF Museum. Haven’t been there since 2001. I’ve done the Lake Erie Coastal Trail several times and written multiple stories about it (including one that lists many highlights along the 293-mile route and links to my other stories about individual sites along the trail. Among my favorites are Marblehead Lighthouse (a short detour off of the main route to the tip of the Marblehead Peninsula), Lake View Cemetery in Cleveland (for regional history, architecture and landscaping buffs), and the 18 covered bridges in Ashtabula County. I love Marblehead Lighthouse! I never visit the area without stopping at the lighthouse. I’ll definitely check out your site for some recommendations when we prepare to head out on the Lake Erie Coastal Trail. The cemetery sounds like a fun stop and the covered bridges have long been on my list to see. 2nd weekend in October is the covered bridge festival and it’s awesome to go to. They have maps to follow and park personal to give history of the bridges and even a few of the fily members that the bridges were named after. Its a wonderful weekend trip with lots of wineries and restraunts to eat at. i love ohio!! my MIL lives near dayton – definitely head to the USAF museum – i could spend days there!! 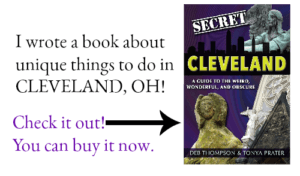 also, read terri weeks’ book, adventures around cincinnati – she covers a LOT of ohio, and really cool tips! 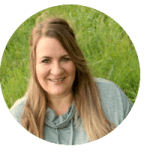 What an amazing list – you are going to be one busy lady! I have actually never been to Ohio so I look forward to reading about your adventures! That is awesome! Can’t say I have ever been dying to get to Ohio, but maybe after your year, my perspective will change a bit! Thanks for linking up this week! I have missed you too!! What a great list! We are in Cleveland and have been to some of these places but there’s so many more to see. I’m bookmarking this so the next time we say to ourselves, what should we do?, we’ll have some ideas! I live in Tuscarawas County, which has a lot of great hiking trails at the Norma Johnson Center and The Wilderness Center (which is actually in Stark Co. in Wilmot, but just across the border from Tusc.). We go camping a lot, and we always go to Hocking Hills every year. It’s probably our favorite place in Ohio. Our county borders Holmes County, which is Amish country, so that obviously is a place we go regularly. A state park that we enjoy is Dillon S.P. in Zanesville. It is never crowded and there is a lot to do there. We always stop at Tom’s Ice Cream Bowl when there…yummy! If you’re still looking for suggestions for a unique hotel, try Landoll’s Mohican Castle in Loudonville. We stayed there for our 3rd anniversary and it was MAGICAL! While there, check out Mohican S.P. – my hubby loves it for the mountain-biking. A place we are going to try to make it to this year is Jungle Jim’s International Market in Cincinnati. As much as I complain about the weather here, I have to admit that Ohio is an awesome place that offers a lot do. Best wishes on your bucket list! What great suggestions, Linda! I’m so glad you shared your ideas! Mohican State Park is near our home so we visit a lot. While we normally just spend the day hiking, we sometimes camp there. Last fall, my husband and I stayed at the resort for a church retreat. We had a great time! Have you been to nearby Malabar State Farm? Not as extensive as Mohican, but there are hiking trails there as well- one leads to a cave that you can actually walk through and climb out of. We stayed at Landoll’s last July for our anniversary and loved it. You can see my pictures and post here: http://travelinspiredliving.com/landolls-mohican-castle/ I can’t wait to go back. While we were there we took a carriage ride. The driver told us that winter is the best time to visit because they do sleigh rides. I’ve been dying to go back since we got snow! Landoll’s actually spoiled my husband, since then he’s decided that he won’t stay in a normal hotel room again if it’s a trip for he and I! Too funny! I would love to hear your recommendations for Amish Country. I’ve been there many times, but it’s beginning to feel like I see the same things each time- Heini’s Cheese Factory, Kaufmann’s Bakery, etc. This year I’d love to visit Behalt! I will definitely look into the state parks that you suggested and next time we’re in Zanesville I’m sure my teens wouldn’t complain too much if we stopped at Tom’s Ice Cream Bowl! I always complained about living in Ohio until we began traveling with my husband’s job and weren’t able to visit the things here that I loved. I do really hate the cold, but more than that, I hated the Alabama heat in the middle of July! 😉 Atleast when it’s cold in Ohio, I can bundle up and relax near a fire. When it’s hot in the South, it’s only legal to remove so much clothing! Ha! Yes, we went to Malabar Farm this past summer, but didn’t hike. We just did the tour – it was super hot that day, so I don’t think my 4-year-old would have lasted long on a hike (probably mama wouldn’t either!) We’re definitely going back there again this year – they have some festivals coming up in the spring and summer that we’d like to go to. Sorry, I missed that you already went to Landoll’s – I just stumbled upon your blog today when I was on a bunny trail. Glad you enjoyed it as much as we did! We also tend to get in a rut with Amish Country…Heini’s, Flea Markets, Berlin, etc. We went to The Farm at Walnut Creek this past summer and loved it. They actually provide sleigh rides in the winter if there is enough snow on the ground – you still get to see most of the animals, but by sleigh! If you go to Sugarcreek, they offer wagon rides through town in the summer. They also have their 50’s Fling in June and the Swiss Fesitval in September. We also like Charm – Keim’s Lumber is more than a hardware store and Grandma’s serves up a great Amish breakfast. I’ll let you know if I think of anything more. Thanks for the advice on Jungle Jim’s! I definitely will keep my eye on your blog now that I’ve found it. We also are homeschooling and love to travel, so we have a lot in common! Oh…and if you’ve never been to the Hartville Flea Market or Rogers Flea Market, they are must-do’s! I found your blog through pinterest, fascinating read. I had no idea there were so many things to do in Ohio. If you are still looking for suggestions, there is an Amish run restaurant in Wilmot in Stark county called the Amish door. It would be a good place to visit if you were to also visit the Wilderness Center in Wilmot. In Beach City, just a couple miles from there, is a place called Baylor’s Beach where families can swim, play miniature golf, and camp. Thrre are also two camps near by: Camp Wanake and Camp Buckeye. There are a lot of amazing sights at Camp Buckeye. A factory tour you could go on could be Harry London’s in Canton. I’ve heard great things about the Amish Door. It would be a great place to eat next time I’m in Amish Country. I’ve never heard of the Wilderness Center or the camps. Harry London’s has the best chocolate! I can’t wait to visit again for some delicious samples. Thanks for sharing! Hi all, just want to say, I too love the Mohican State park area, in fact, love it so much and visited the area so often I started a Luxury cabin rental business. There is just so much to do in the area with Malabar farms, pleasant hill lake, horseback riding, canoeing, mountain biking, minerature golf, zip lines. I could go on and on there is so much to do. You can see our cabins at mohicanpines.com. , we now have three total all with hot tubs, fireplaces and fire pits. When do we start? Maybe I could fit some inexpensive or free ones in before February! I went on a trip to Ohio when my husband and I were still dating. As an AA-er we stopped by Dr.Bob’s house in Akron. Even if someone’s not AA, the history of that home and the many different people who detoxed and became sober is a remarkable thing. Great experience visiting. I just learned something new. I have never heard of Dr. Bob’s house. I’ll definitely look into that. Thanks for the tip! I’ll check out the Quaker Oats factory too! I had no idea the AA house was in Ohio! I loved it so much because it was quiet and we were the only actual beach goers without a dog, the dog owners just walked their dogs and then left. That was during the week that I took my kids and a friend (or two or three) and visited something different each day. We went to Seneca Caverns, Akron Zoo (with a side trip to Mr Bulky’s), COSI, the Santa Maria museum, Topiary Gadens, Lake Erie Nature and Science Center (LENSC), Columbia Park Beach, and finished out the week with the Crestline pool and Kingwood Center. I hadn’t been to any of those places before except the Crestline pool and Kingwood Center. It was fun finding new things to do with the kids and I am hoping to do a vacation like that again for them this year. I want to go on some of your road trips with you 🙂 Maybe we could plan a couple together. Thanks for the tip. I’m going to plan on checking out that beach. When the kids were little we found a wonderful beach along Lake Erie that wasn’t very crowded and we spent the entire day there. I think it was near Huron. I wish I remembered which one it was. It would be fun to revisit now that my kids are older. The beach in Huron was more than likely Nickelplate Beach or the park beach by the Episcopal church. Either are great! But when in Huron you have to get orange sherbet from the Pied Pipe. I was always under the impression Amish made Pennsylvania home, thanks for pointing out its your state! This post makes me want to visit now! I want to hit Cuyahoga National Park and Hocking Hills in Ohio. We are not too far from you guys here in Illinois. I did not know that about the Amish though, I had thought about visiting Lancaster County but Ohio is closer :). What blogging conferences are there? I’ve been thinking about going to one, but I wasn’t sure how to find where they are located. The only one I know of is through TBEX and that one is in Toronto this year. Love the idea of checking out your home state, I should do some of my own research on my home state. Cuyahoga National Park is on my list to visit. I’d actually like to take my train ride through the park in the fall. I think it’d be beautiful. Hocking Hills is beautiful. My parent’s visit often and had raved about it for years but we never went. After we finally did make the trek (under two hours from my house, not bad at all), and saw how beautiful the area was, we decided we needed to visit at least once a year. This year my goal is to find another trail to love there. I live in Hardin County as well. I need not travel far for a real AUTHENTIC Amish experience. I’ve been to Holmes County several times and it is so commercialized. It is all about the tourism and selling rather than a true Amish experience. Over the years I have became friends with some Amish families in Hardin Co. and they are some of the nicest people you’ll ever meet. My family and I have been lucky enough to be invited in and shown the loom that’s used for making rugs, the medicine and supplies, and how they prepare the milk for pick up just to name a few. I can honestly say that I’ll never go anywhere else to see genuine Amish families and their way of living especially since they are only about 20 miles away. So many places, so little time…..